If you're driving to the Walt Disney World® Resort in Florida, knowing which way to go and what exist to get off will take a lot of stress off your vacation. Below are ways to get to Walt Disney World from Orlando International Airport, how to get there from within Florida, including the Walt Disney World Interstate exits and directions from varies cities within the United States. Your best options to get to Walt Disney Resort from the airport to use Disney's Magical Express Service, an airport shuttle or car rental. 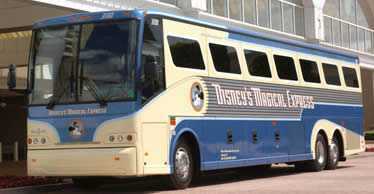 Disney's Magical Express Service - is a free comfortable transportation to and from the airport in deluxe air-conditioned motor coaches provided by Disney World Resort. With Disney's Magical Express Service, you save on transportation costs, tolls, parking, and more. Upon arrival, your luggage is picked up at Orlando International Airport. Disney takes you from the airport to your hotel check-in, while your bags go straight to your room. Airport Shuttle - the recommended shuttle option from the Orlando International Airport to Walt Disney World Resort is Mears Airport Shuttle. Shuttle tickets may be purchased at the time of boarding. For return to the airport, the shuttle boards at the entrance of every Walt Disney World Resort hotel. Make reservations 24 hours in advance and allow a minimum of two hours before flight time. Q. What are the best driving routes to the Walt Disney World Resort? Q: What are the best driving routes to the Walt Disney World Resort from within Florida? A: Walt Disney World Resort is located southwest of Orlando, off Interstate 4, west of the Florida Turnpike. If you are travelling within Florida, here are directions from some major starting points. Q. There are so many Walt Disney World Interstate Exits. Which ones should I take? Disney's Magical Express service is a complimentary and convenient transportation that runs continuously throughout the day. The lynx #50 bus goes from Disney Springs to Downtown Orlando and have a stop near SeaWorld Orlando.